Cleaning your computer, components, and peripherals help keep everything in good working condition, helps prevent germs from spreading, and helps allow proper air flow. The picture shows a good example of how dirty the inside of your computer case can get. Looking at this picture it's immediately obvious that all the dust and dirt is going to prevent proper air flow and may even prevent the fan from working. CD-ROM, DVD, and other disc drives. CD, DVD, and other discs cleaning. In a clean office environment. In construction or industry environment. Have cat or dog in the same building as computer. Smoke in the same building as computer. Smoke next to the computer. The computer is on the floor. The room with the computer has carpet. Eat or drink by computer. Young adults (ages 10-18) use computer. Pre-teen (younger than 10) use computer. More than one person uses computer. With what is checked above, clean your computer every 11 months. Make sure all vents and air holes are hair and lint-free by rubbing a cloth over the holes and vents. It is also helpful to take a vacuum around each of the hole, vents, and crevices on the computer. 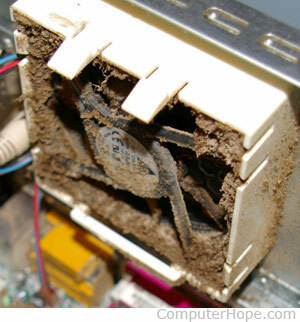 It is safe to use a standard vacuum when cleaning the outside vents of a computer. Procedure: To clean the CD-ROM drive, we recommend purchasing a CD-ROM cleaner from your local computer retailer. Using a CD-ROM cleaner should sufficiently clean the CD-ROM laser from dust, dirt, and hair. Why? Dirty CDs can cause read errors or cause CDs not to work at all. Why? Computer hard drives cannot be physically cleaned. However, they can be cleaned with software utilities to help it run fast and efficiently. Utilizing these utilities prevent the hard drive from slowing down. How to clean a computer hard drive. These steps are for cleaning a desktop keyboard. See the cleaning a laptop keyboard page for laptop steps. Many people clean the keyboard by turning it upside down and shaking. A more efficient method is to use compressed air. Compressed air is pressurized air contained in a can with a very long nozzle. To clean a keyboard using compressed air, aim between the keys and blow away all the dust and debris that has gathered there. 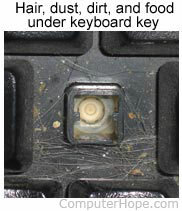 A vacuum cleaner can also be used, but make sure the keyboard does not have loose "pop off" keys can be sucked up by the vacuum. If the keyboard has anything spilled on it (e.g., pop, cola, Pepsi, Coke, beer, wine, coffee, and milk), not taking the proper steps can destroy the keyboard. If anything is spilled onto the keyboard, turn the computer off immediately or at the very least disconnect the keyboard from the computer. Once done flip the keyboard over to prevent the substance from penetrating circuits. While the keyboard is upside down, shake the keyboard over a surface that can be cleaned later. While still upside down, use a cloth to start cleaning the keys. After the keyboard has been cleaned, leave the keyboard upside down for at least two days allowing it to dry. Once dry, continue cleaning the keyboard with any remaining substance. If after doing all the above steps the keyboard still does not work, we recommend buying a new keyboard. When cleaning the LCD or LED screen, it is important to remember to not spray any liquids onto the screen directly. Press gently while cleaning and do not use a paper towel since it can scratch the screen. Computer flat-panel and LCD help and support. Another good alternative to compressed air is a portable battery powered vacuum. Portable vacuums can effectively remove the dust, dirt, and hair from the motherboard completely and prevent it from getting trapped in the case. Warning: Never use an electrically powered vacuum, as it can cause lots of static electricity that can damage the computer. When using a vacuum, keep it a couple of inches away from the motherboard and other components to prevent damage and anything from being sucked into the vacuum (e.g., jumpers or small cables). Procedure: To clean the rollers of an optical-mechanical mouse, you must first remove the bottom cover of the mouse. To do this, examine the bottom of the mouse to see what direction to rotate the cover. As you can see in the below illustration, the mouse cover must be moved counterclockwise. Place two fingers on the mouse cover, push down and rotate in the direction of the arrows. 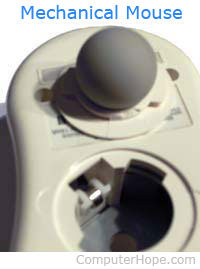 Once you have removed as much dirt and hair as possible, set the ball back in the mouse and place the cover back on. Why? To help keep the mouse clean and germ-free. Below is a listing of miscellaneous computer hardware that is rarely used today, but kept on this page people working on older computers and need to clean these devices. Procedures: The floppy drive is cleaned two different ways. The first method of cleaning a floppy drive is to purchase a kit at your local retail store designed to clean the read/write heads on your floppy drive. The second method of cleaning the floppy drive is only recommended for experienced computer users. Open the floppy drive casing and physically swab the read/write heads with a lint-free foam swab soaked in pure alcohol or trichloroethane. When performing these steps, be extremely careful when cleaning the heads to ensure that you do not lock them out of alignment causing the floppy drive not to work. To help prevent the heads from becoming out of alignment, use a dabbing motion lightly putting the swab on the head and removing it, do not perform a side-to-side motion with the swab.